Published by Joshua Clare-Flagg on 1 Jul, 2015. 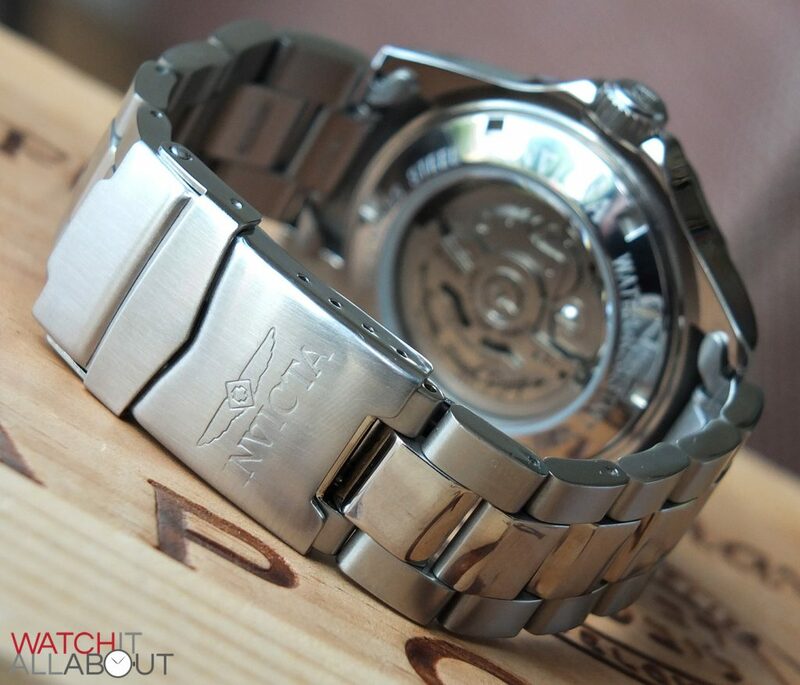 The Invicta Pro Diver 9094 has got a bit of a marmite following – you either love it, or you hate it. 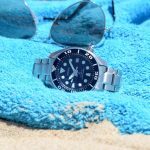 Nevertheless, it’s had a lot of publicity whether it’s for good or bad, so there’s no denying that it’s a well known watch in the affordable watch markets. 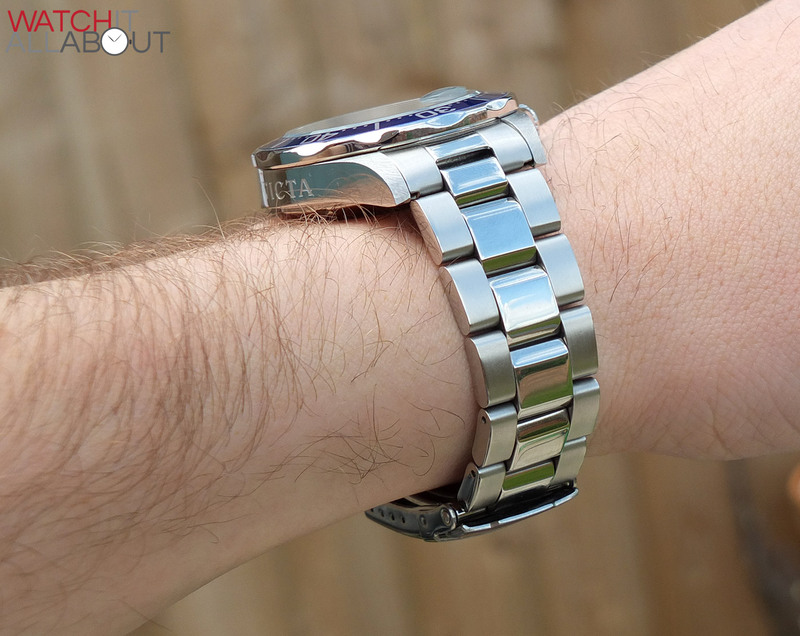 You can usually get hold of one for around the £70 mark from Amazon or eBay, so it’s definitely a watch that is cheap – especially when you consider the movement that’s within it and the surprising build quality. The reason why people hate them? I believe it’s just because they’re a Submariner homage. But there’s so many out there, so why should the Invicta get so much hate? 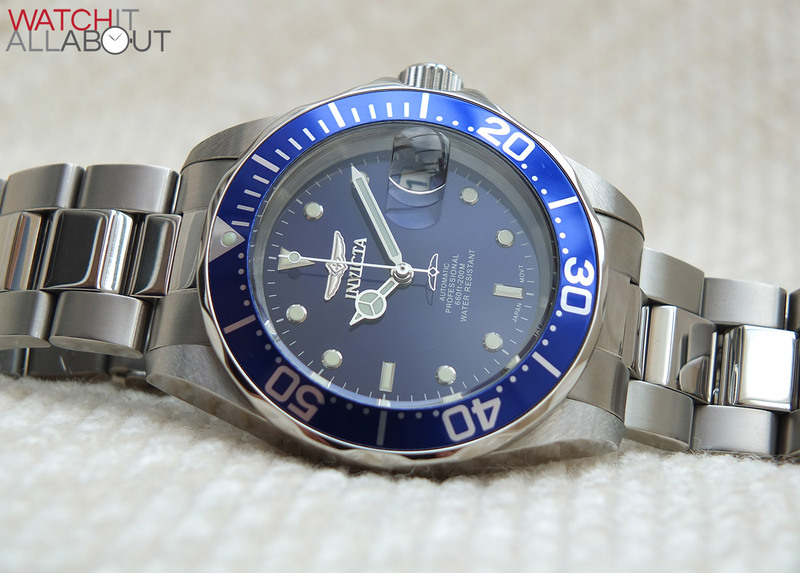 There’s no way near as much hate for the Steinhart Ocean 1, and in my opinion they obviously both look as much like the Rolex Submariner as each other. My personal opinion is that I have no issues wearing a homage, thus the Invicta is going to sit happily on my wrist. So let’s take a closer look at it to see if it truly is good value at £70. The case is the perfect size in my mind, and also mimics the Submariner well – being 40mm in diameter. It has a 48mm lug to lug length, so it sits well on the wrist (I have a 7 and a quarter inch wrist and it fits me perfectly). The height of the case is 13mm, so although it’s not the slimmest watch in the world it’s still reasonably streamlined considering it has an automatic movement in it. It’s thin enough to fit under a cuff, just. 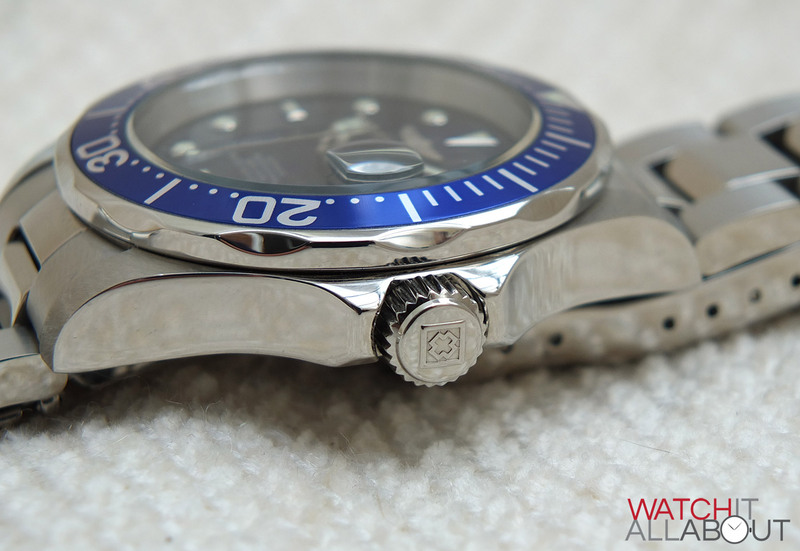 The case has a 200m water resistance rating thanks to its screw-in crown and caseback. This means that it’s suitable to be worn snorkelling and shallow diving. Not bad for the price really. I’ve dipped mine in the sea just to make sure that it is water resistant and no moisture got in the case which was good! The case has a variety of finishing, namely a brushed top of the lugs, and polished everywhere else. The brushed finish is a little rough and you can tell that it’s not the best quality finishing, but thankfully it’s only on a small amount of the watch. The polished finish is very good however, with a mirror-like appearance and no tool marks apparent anywhere. 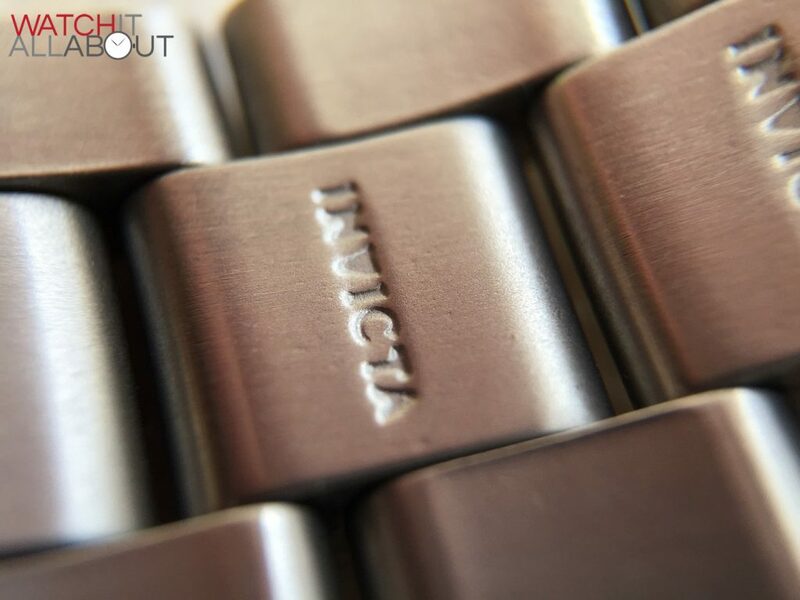 Down the side of the case opposite the crown, the word “Invicta” is engraved rather surprisingly deep. Now, I’ve always been a bit put off by this feature – I’ve always thought it was a bit brash and ugly. But seeing it in the flesh has actually shown me that it’s not quite as bad as I initially feared. Yes it’s easy to spot, but it’s not quite as bold as it could be. It’s actually engraved with surprising depth and accuracy – usually I’d expect some cheap looking laser etching here but this is proper engraving. Not bad. 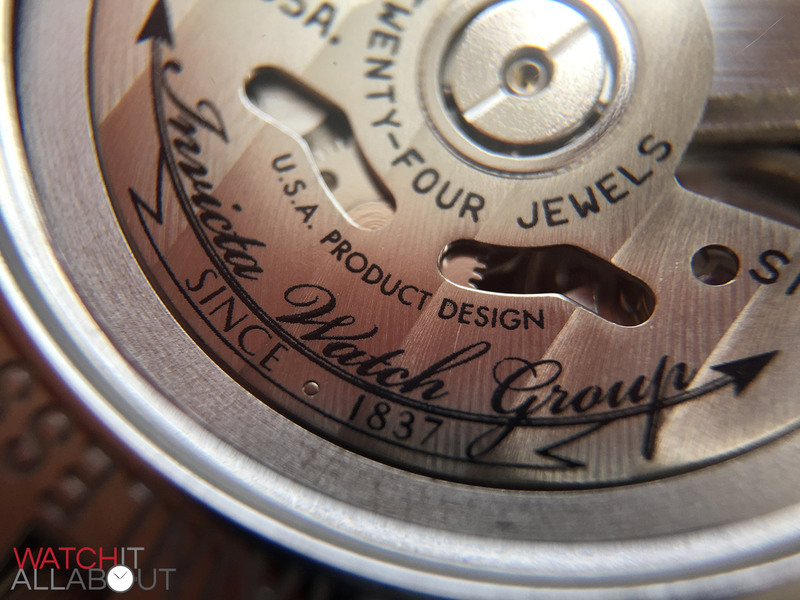 The screw-in exhibition caseback is completely polished to match the rear of the case. The exhibition window is mineral crystal, which is perfectly acceptable as it will very rarely get in the situation where it will get scratched. It’s also a decent size, fitting the entire movement and the great customised printed rotor within it. Surrounding this window is the name and various watch specifics, such as model and manufacturer names, water resistance and stainless steel. Just like the Invicta down the side of the cases, these are all surprisingly deeply engraved and provide a feeling and appearance of quality that you wouldn’t expect at this price point. 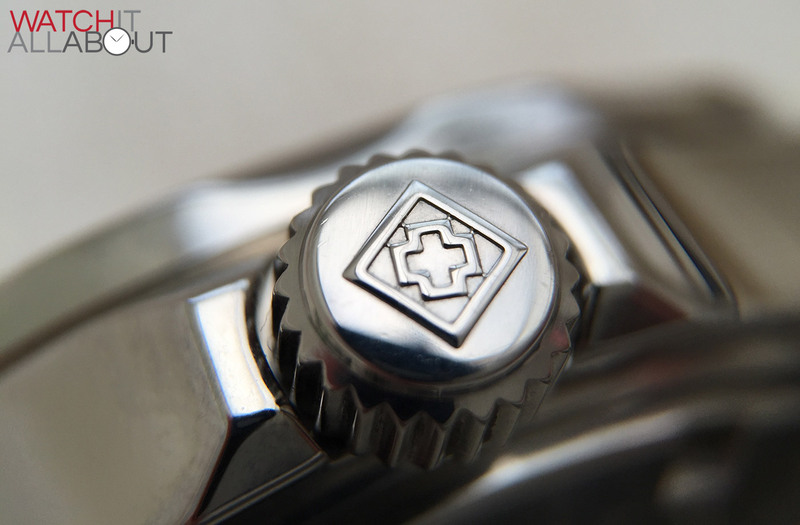 The screw-in crown has the centre of the winged logo embossed on it, which is a cross within a square. Again, I wouldn’t have expected this and it is a nice plus. The crown is polished to match the side of case, and is finished to a matching standard. The only thing worth noting about the crown is that the thread is a little dubious and can take a bit of fiddling to catch it to screw the crown back in. This is always a little bit of a worry for me as it feels like it could thread at any moment. But, it’s proved to be ok so far so hopefully it never will. The grip of the crown is good, deep and well machined. The crown guards protrude halfway up the crown, providing a reasonable amount of protection from glancing blows. They smoothly extend from the side of the case, with a gentle sweep that originates from the very tip of the lugs. 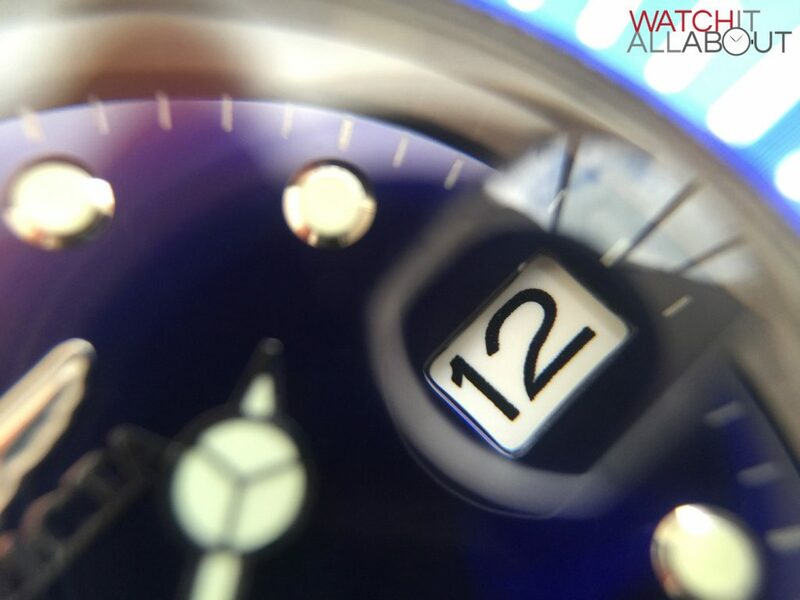 The bezel insert is a lovely deep blue to match the dial – although it is a little lighter. 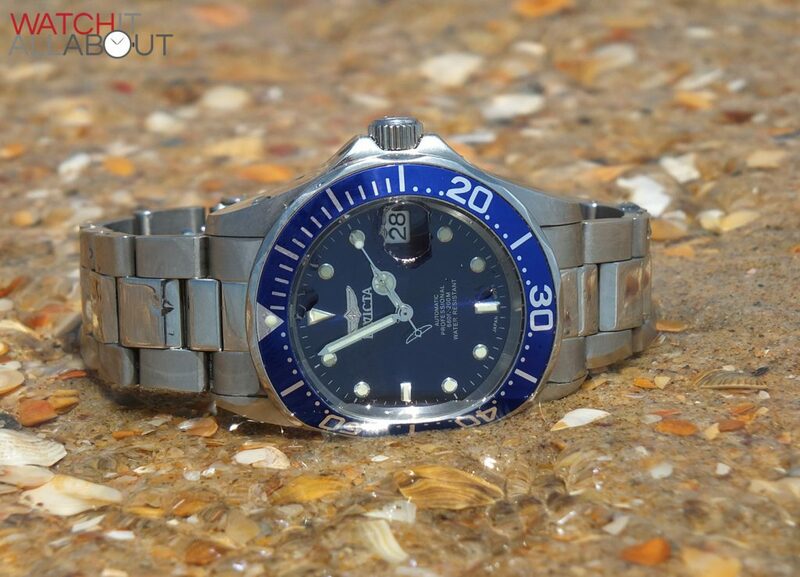 The markings on the steel insert are a standard affair, based upon the classic Submariner style. The markings are all fairly accurately executed. The lume pip is located at 12 within a small triangle and is neat, tidy and excellent strength – to match the lume on the dial. 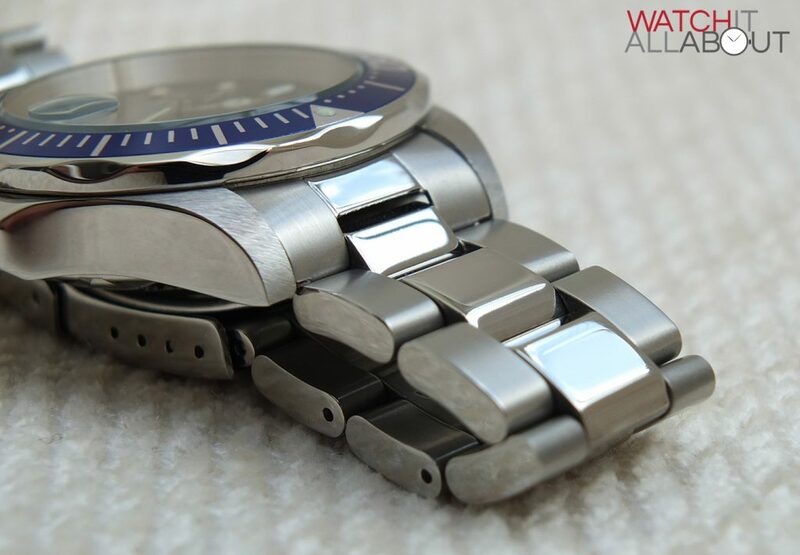 There is a slight knurling around the top edge of the bezel to aid grip whilst using it. The mechanism does sound a little on the cheap side when you’re turning the bezel, although the action is reasonably smooth and lines up well. The edging of the bezel is polished to match the majority of the case. Sitting atop the case is a mineral crystal. Yes, we’d all prefer sapphire crystal of course because of its scratch resistance. 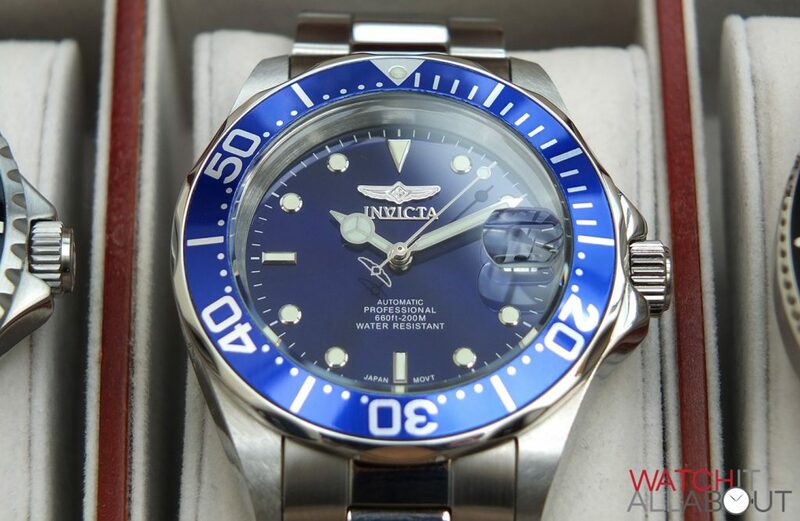 But, on a watch costing £70 it’s pretty hard to find a watch with sapphire, so in the case of the Invicta Pro Diver, mineral crystal will suffice just fine and is something we can overlook. It does appear to have some sort of anti-reflective coating on the underside, although mineral crystals naturally provide greater clarity than sapphire anyway. So it’s very good in terms of keeping the reflections at bay. There is a date magnifier located at 3, funnily enough just above the date window. I’m not sure if it’s my eyes, but it does seem to be fractionally wonky – but only if you look really hard. The magnification works really well (sometimes on the cheap Chinese watches they don’t actually do anything), resizing the window to around 1.5x. I’m very surprised with the quality of the case. The only downsides really are the mineral crystal, but on a £70 watch this would be extremely unusual to have, and the feeling of the crown threading. The dial on the 9094 is a deep, dark blue. It has a slight sunburst effect to it too, plus it has a polished finish to it, thus it appearing reflective rather than matt. 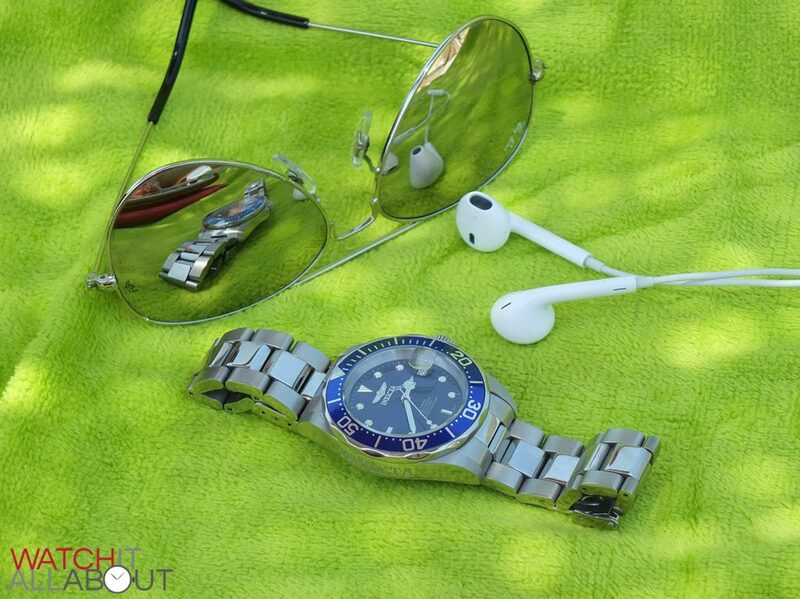 This creates a pleasant lighter reflection that rotates around the dial depending on the angle. 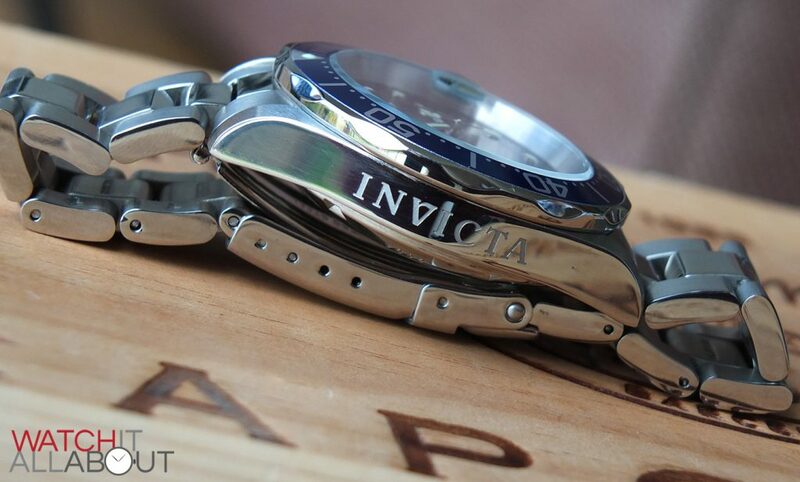 I always like a decent applied logo, and the Invicta Pro Diver hasn’t disappointed me. 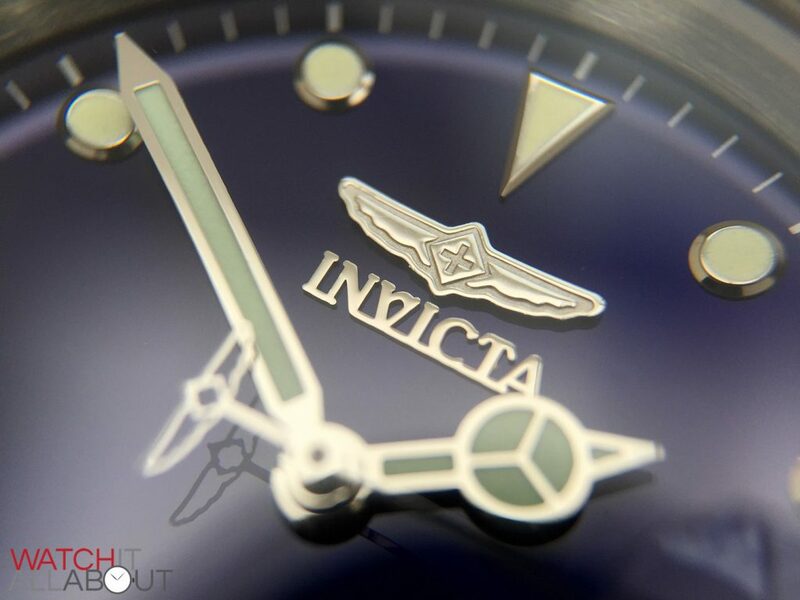 The logo is made of two-pieces, with the main winged icon located above the Invicta name, also applied. Both are made to a high standard accuracy-wise and also look good quality (sometimes applied items can look a bit thin and cheap). The logo is a polished finish, which is nicely reflective in the light. The applied hour markers are fairly unimaginative, again imitating the Submariner. At 12 we have a triangle, and at 3, 6 and 9 we have batons. All the rest are discs. The hour markers are all lume filled and have a chamfered polished border, reflecting the light as well as the logo and hands. The quality of them all is fine and they are all made with impressive accuracy and precision. 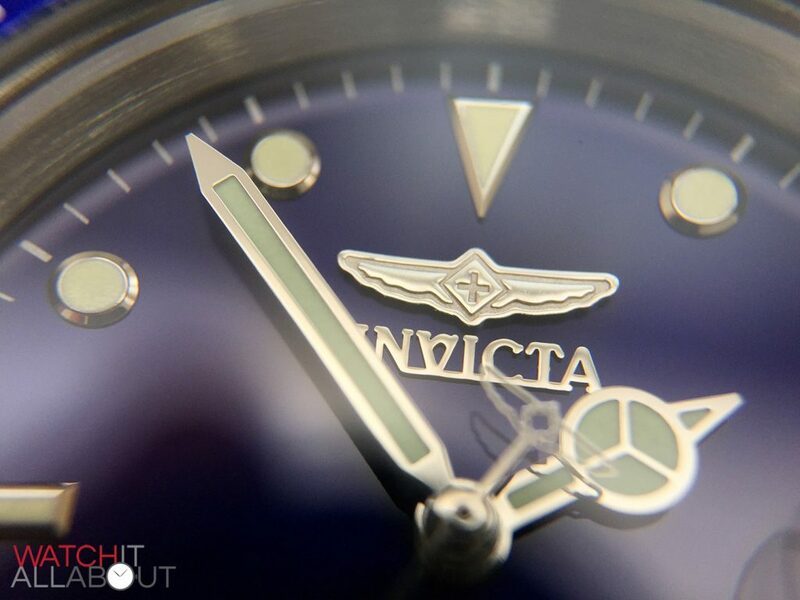 The hands are your standard Mercedes hands (makes sense as its a Submariner homage), but the second hand’s counterweight has its own little twist, that being it is the winged Invicta logo. This counterweight logo is made with very good precision and is pleasantly neat and tidy even under the macro lens – which is much better than what I was expecting. Near the end of the seconds hand is a lume filled disc so you can see the second hand in the dark. The minute hand is a pretty simple baton, with a pointed tip and thinner base, the entire length lumed. The hour hand’s main feature is, of course, the Mercedes logo just past half-way up the length of it. It’s entirely lumed and all the hands are a flawless polished finish to match the reflective properties of the dial itself, logo and hour markers. When they all catch the light together, the dial really lights up. The lume is another pleasant surprise for me. I wasn’t expecting it to be as strong as it is. 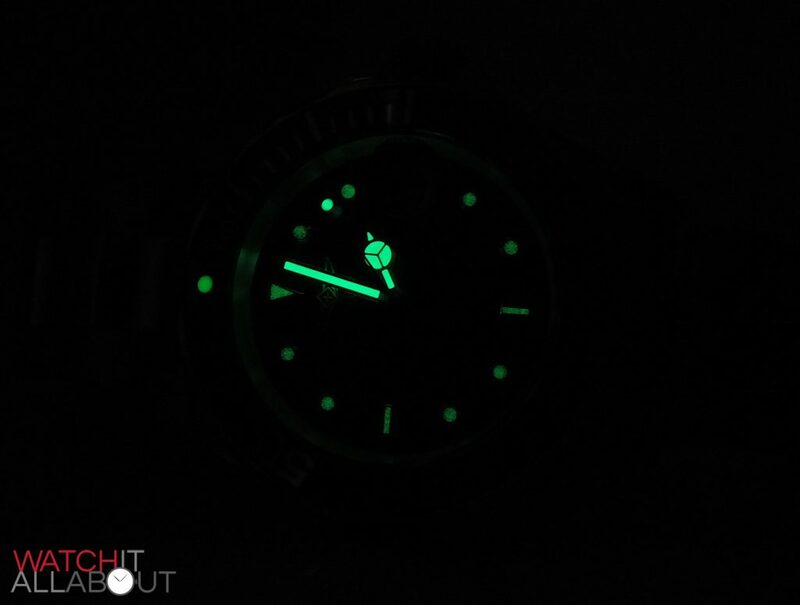 When you think about it, most watches under the £100 usually have extremely poor lume that doesn’t charge well, or glow with any particular strength. 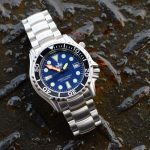 But, the lume on the Invicta is definitely strong enough to rival the Seikos in the same price range, such as the SKX007 – and that’s saying something. It charges quickly, even just from a few minutes of direct sunlight, and it glows bright and strong. It also lasts a fair amount of time, so it has definitely been a pleasant surprise. The printing in general on the dial is fine and crisp. We have a small and delicate minute track around the outer edge, made of thin white dashes. 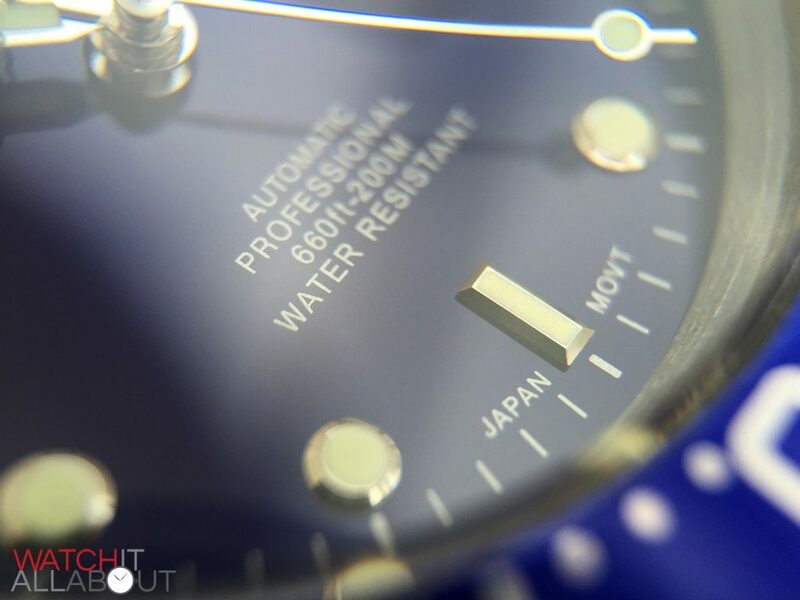 At the foot of the dial are the words “Japan mov’t”, and in the centre of the bottom half is “automatic, professional, 660ft / 200m, water resistant”. It’s all well printed and is perfectly legible on the reflective dial. The date window is just cut straight out of the dial. Usually I’d prefer to see some sort of border to it, but this is not usually the case with Submariner homages with a magnifying cyclops. From what I can see, the edging of the window is neat and well machined. It has a very slight chamfering to it which is a good solution to keeping it looking refined. The date wheel itself is white, which may upset some but it’s very rare to get a special wheel to match the dial colour at this price (when it’s not white), even more so if it’s a colour that’s not black. The printing on the wheel is black, and is precise, without any smudging. Just like the case, the dial supports my growing appreciation for this watch. It’s proving to be pretty flawless in all aspects, and even surpasses my high expectations. The dial is made extremely well for the price, and the strong lume is the cherry on top. The bracelet is a very suitable and reasonable 20mm wide at the lugs, reducing to 18mm at the buckle. This gives a smart look, whilst still providing a suitable amount of heft to create a quality feel to the watch whilst on the wrist. The bracelet has a polished centre link with brushed side links which are polished at each end. The finishing of each link is very good, the brushed side links being uniform. The seem to be better quality than the tops of the lugs on the case. The centre link is well polished too, matching the mirror-like appearance of the case. 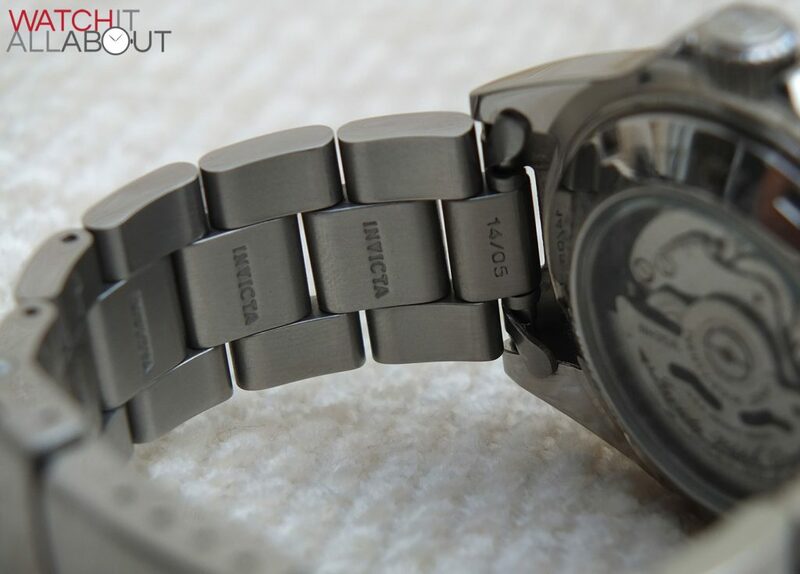 The rear of each link is completely brushed, supplying a soft and comfortable wear in the wrist. 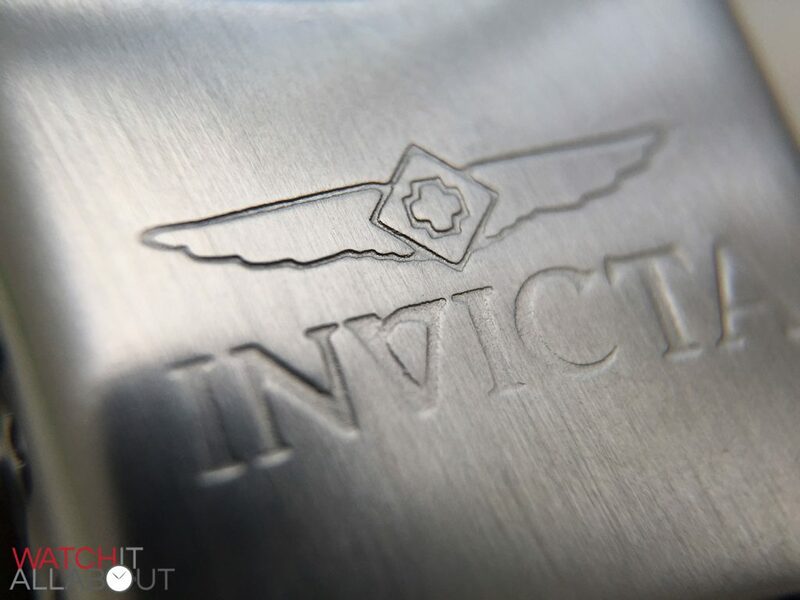 The word Invicta is also engraved in the centre of the back of every link which is a nice and unusual touch which isn’t really necessary, but is pleasing to see and shows a little bit of thought and effort has gone into the bracelet. The buckle is double locking, which is through snapping the it shut then securing the flap over the top. 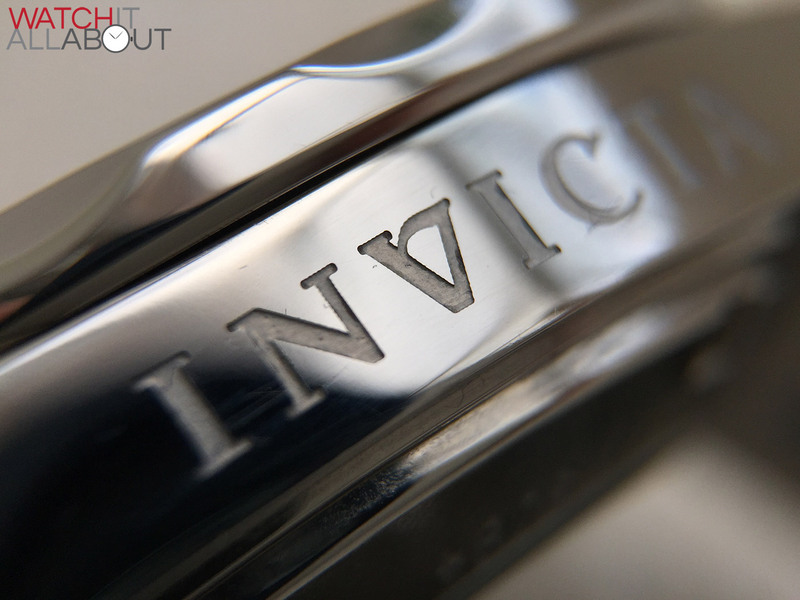 It is brushed with the full Invicta logo engraved in the centre of the top, again to a depth and accuracy that is quite a pleasant surprise. The brushed finishing is a little light, so it may mark easily and get some desk diving scratches fairly quickly. The elbow section of the buckle is a little weedy, but is ok when it’s closed, as it’s pretty streamlined and fits close and comfortably next to the wrist. Isn’t the Submariner buckle fairly weedy too anyway? The main negative about the bracelet is the hollow end links. The only caveat here is that they manage to fit the case quite well, nice and tight. So it doesn’t look so cheap and flimsy from above, only underneath where you can see the folded steel and hollow section. 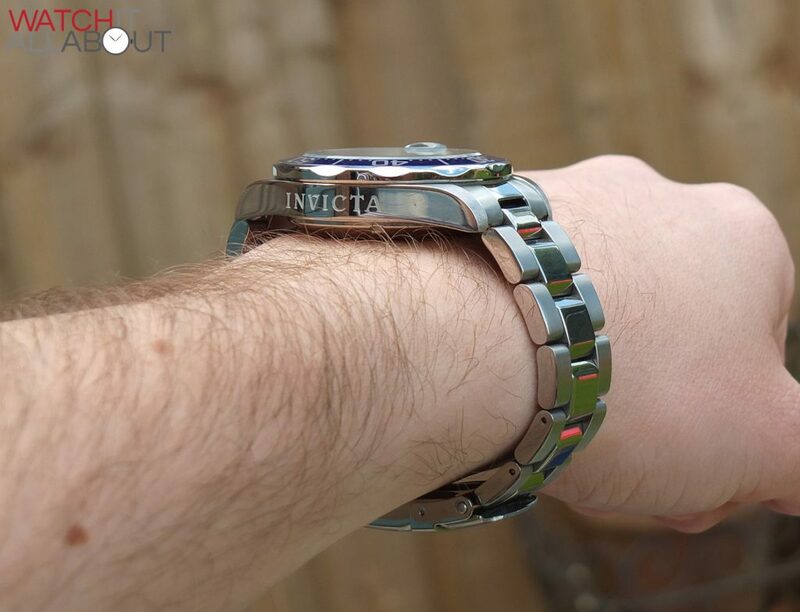 Whilst there is a couple of issues here, all in all its a fairly competent bracelet which fits the case and wrist well and is very comfortable. 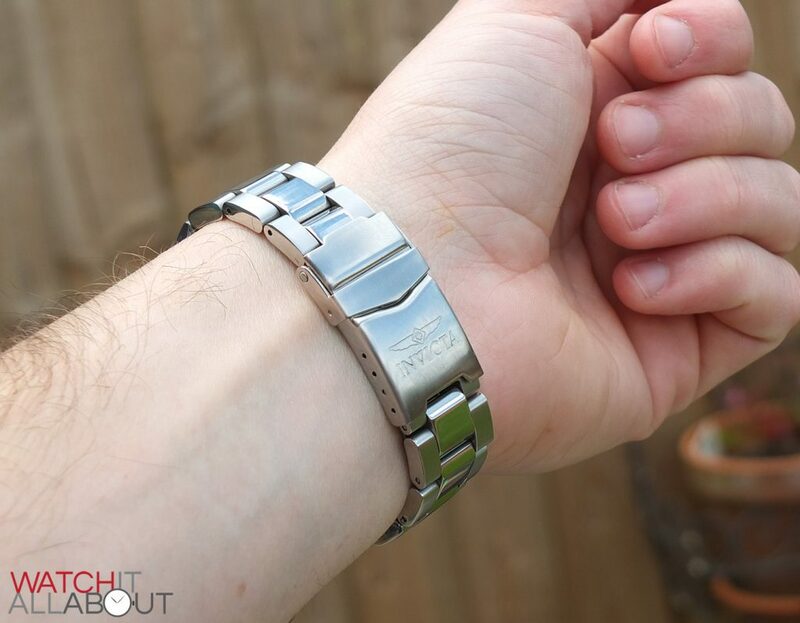 It doesn’t actually look that bad on the wrist, so the hollow end links and light buckle don’t really cause a massive issue unless you’re closely inspecting it in your hands. 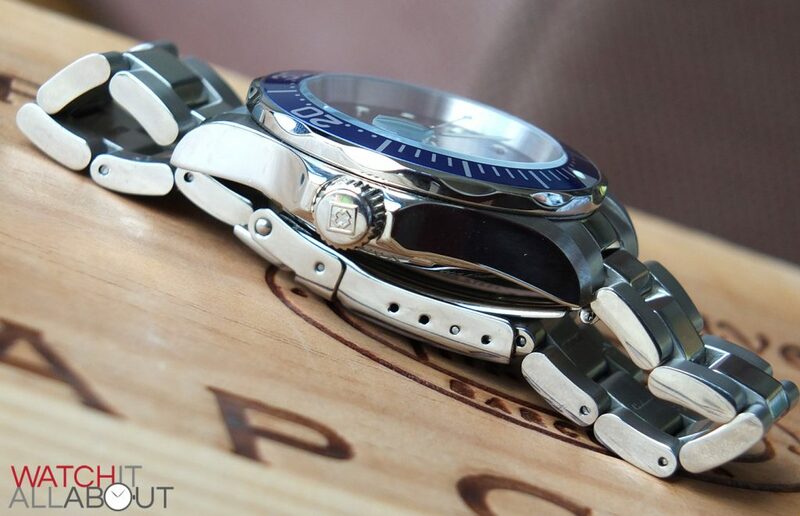 The movement within the Invicta Pro Diver is the epic Seiko NH35A SII. This is an incredible movement to have in a watch that you can get for £70. This movement can usually only be found in watches costing above the £200 mark, such as the Melbourne Watch Co Parkville, G Gerlach Orzel, and the Gruppo Gamma A-41. It’s based on the standard Seiko workhorse movement, but has a few upgrades. It’s gained a very good reputation of being highly accurate straight out the factory and is also super reliable. It runs at 21.6k bph (6 ticks per second) and has 24 jewels. Other interesting features are the fact that it winds in both directions (rotor spinning clockwise and anti-clockwise), has hand wind capability and a hacking seconds hand. It’s also pretty good looking thanks to the custom printed Invicta rotor. Again, this is something very rare to see on a watch costing this much. The rotor has a pleasant and classy looking script Invicta Watch Group logo that really makes it stand out. So I’m pretty chuffed to have this movement in this watch, and so should you. 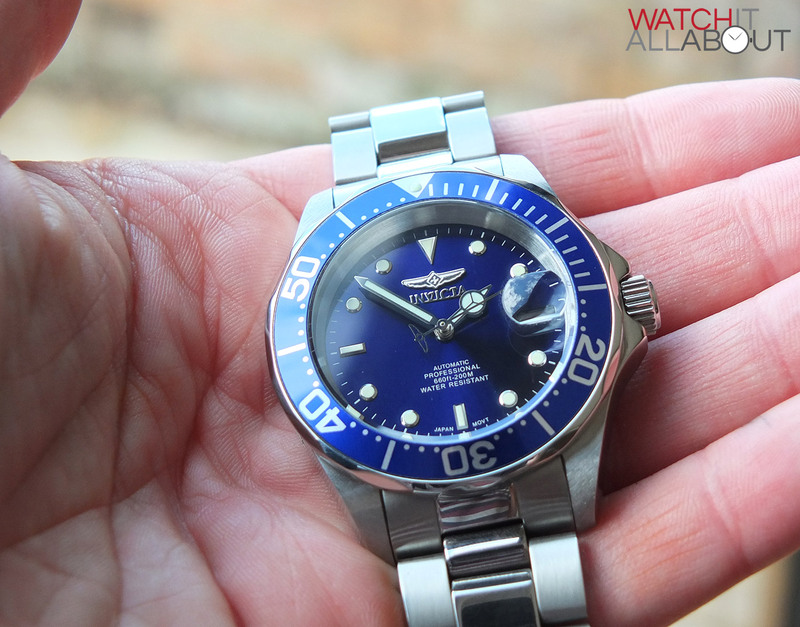 The Invicta Pro Diver is possibly one of the cheapest watches to house it. 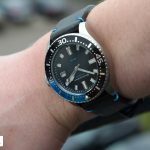 Let’s think about alternative automatic diving watches around this price range. 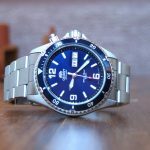 There’s only two that stand out in my mind – the Orient Mako and the Seiko SKX007. Both of which are more expensive. The Orient Mako truly is a star in the affordable market – it’s got so many followers and fans, and rightly so. It has an in-house movement (but no hand winding capabilities), brilliant build quality and smart looks for around £100. It has a mineral crystal like the Invicta. 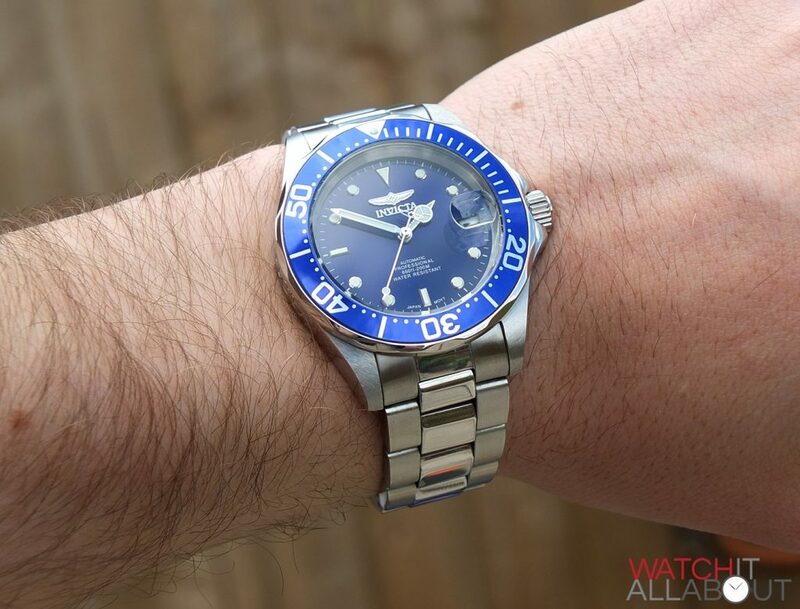 So I guess this is a good alternative if you want a similar quality and specced watch as the Pro Diver but are not too fussed about the Submariner homage and would like a original design. The Seiko SKX007 is definitely not a Submariner homage, it’s much more casual and utilitarian than both the Mako and the Invicta. 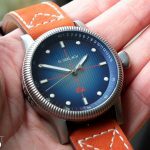 It has an equally huge following, and it really is a tremendous watch for the money – although it is a good £80 more, costing you at least £150. Although it looks fairly standard in pictures, in the flesh you can tell that it’s very well made. 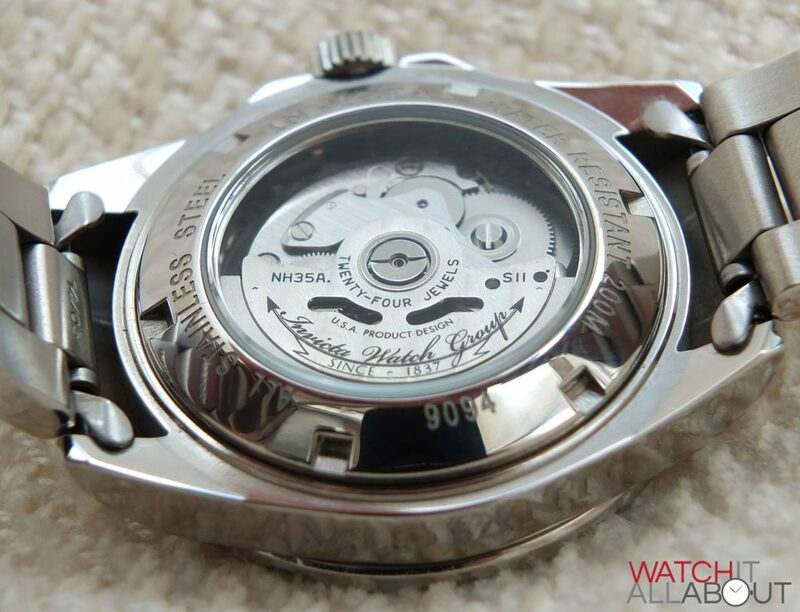 It has a lesser movement than the Seiko, in fact its the movement that the NH35A in the Invicta is based on. Which means it doesn’t have hand winding capability nor does it have a hacking seconds hand. It has a hardlex crystal though, which tends to be thought as a level up from mineral but not quite as good as sapphire. It’s also a ISO certified diver. Let’s be honest, these two are quite possibly two of the best value dive watches available right now so you’d be fine picking any of them. Apart from the fact that it’s a Submariner homage, I can honestly see no reason to dislike the Invicta Pro Diver 9094 as a watch. You truly are getting a lot for £70. Excellent movement, surprisingly impressive build quality (apart from the hollow end links) and pretty great lume make this a winner in my eyes. I really enjoy wearing it and it gets its fair share of comments too. To be completely honest, just like I felt with the Seiko SKX007, I’m a bit disappointed that I’ve waited this long to get acquainted with it. Therefore, I wouldn’t hesitate one bit to recommend one. It’s pretty hard to find a automatic watch looking this good with this quality of movement (everything else this price is with a cheaper Chinese movement and is a Parnis or sterile watch). So, if it catches your eye and you don’t mind the couple of little faults it has, and don’t mind it being an all-out homage to the Submariner (not a problem really in my mind), then go out and buy one. Another very good review Josh, cheers. I was aware of the Invicta brand but it seems to get a panning across the watch world. Having said that, this review highlights what appear to be some good points particularly on this model. I suppose, as you stated, for the money it really is great value. I think the issue about Invicta and homages goes well beyond the homage issue. Invicta is known for flooding the market with often gaudy junk with an inflated MSRP, and sells them on shopping networks. Their marketing is dishonest, at best, and their quality control control and customer service is generally perceived as suspect. Although companies like Steinhart, Squale, Davosa, etc., do sell homages (along with more original designs), they make watches with better build quality (and much better movements), and don’t inflate MSRPs to mislead customers. First of all: You do fantastic reviews! They are very helpfull. 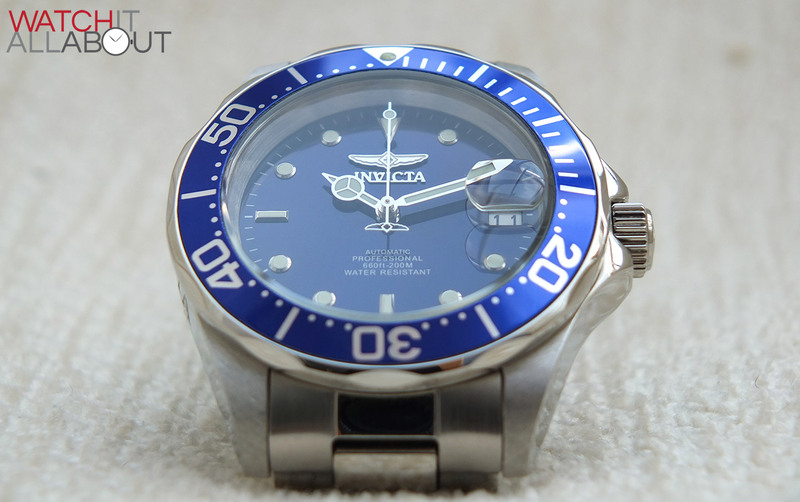 I have a question about the Invicta 9094 Pro Diver that you have reviewed: the rotor has two arrows, one in each direction. I have been told that this means that the rotor will wind the watch any which way it turns, not just in one direction, and that this is more effective. May I ask Where you got the particular model that you reviewed? Does the amazon.co.uk link on this page link to this particular model with this rotor? Hi, I just ordered this model from the link to amazon uk you provided, based on your review. Now I am starting to get worried, if the movement is the same as the one you presented. I double checked, and the model and the year are the same (9094, 2011). So, the question is if the model from amazon is the same as the one you reviewed. If not, well, that would be a bit dissapointing. But, still, the watch looks great, considering the price and your review was very helpful. Thanks! Hi Andrew, please let me know if it does turn out to be correct or if it is not – just so I definitely know the link is correct. Thanks very mic and you’re getting a great watch! I ordered this watch via the amazon.co.uk link provided on this webpage back in july, and the watch is outstanding! Very precise, only about + 4-5 sek a day. The movement is the same as reviewed here, but looks a bit different, as the rotor is painted yellow like the Invicta box, so it’s not the brushed metal color like in this review, which is basically the only (small) disapointment. The rotor winds the movement no mater which way it turns. The overalle look and feel of the watch is great and worth the £74 that I paid. Just received the watch… and it’s identical with the one you reviewed. Same movement, NH35A SII, 24 jewels and the only differences are the ones Tamas Barsi wrote about. I am very happy with the purchase. Definitely recommend the watch from the amazon link. Again, many thanks to Joshua’s review. 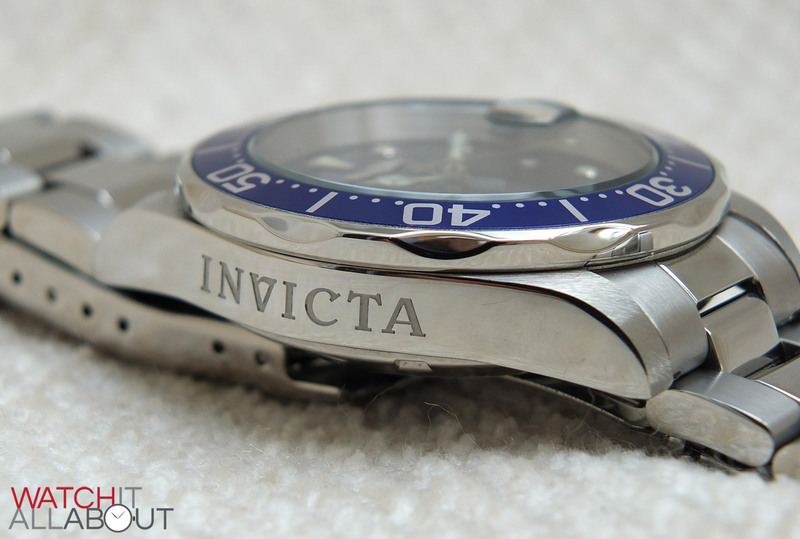 Invicta is based out of Florida, USA and does mass market their watches using inflated MSRP. They might list the MSRP as $1,000 yet sell the watch routinely for 80% off at $199. They are known for hundreds of designs that are visually beautiful watches. 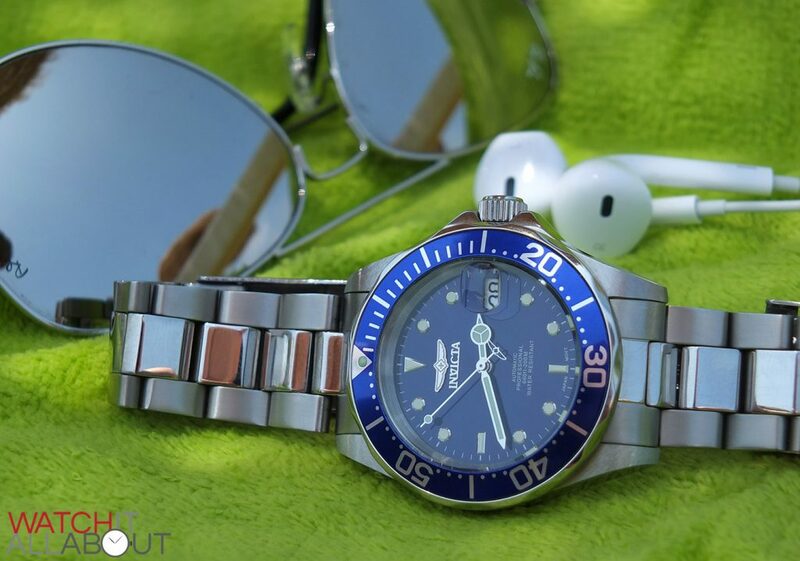 The downside is many people say that they hope they never have a problem with their watch because the Invicta customer service is almost non-existent and super slow. You can read many complaints regarding service online. Several consumer watchdogs in the USA rate the Invicta Company as D+ and F ….. being as bad as you can be rated. 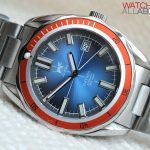 I like the look of their watches but stay away from buying them due to the terrible reputation of the company’s ethics. Just my opinion of course. 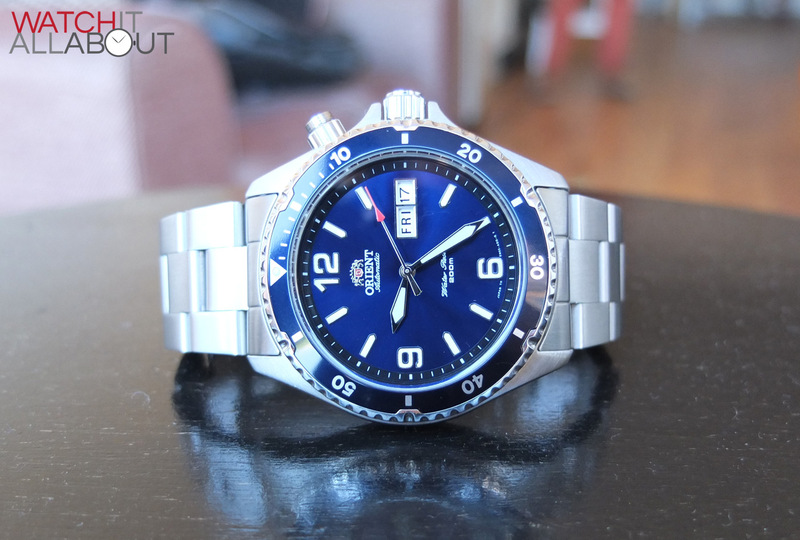 Orient mako has hand wind capabilities ! My Invicta Grand Diver 16041 nh35a movement runs 15 seconds slow a day and the minute hand is off by half a minute at the same time. I can live with the with the 15 seconds but the minute hand really bothers me. Would you call this normal or defective? First, let me say that this was the best and most accurate review I’ve seen to date. I’m no stranger to this watch. I bought this model in Black (dial & bezel) originally about 6 or 7 years ago, and within a year or so when they came out with the coin edge bezel, I bought it and it’s been my go to watch on my arm almost daily for the last 5 or more years. I’m one of those people who like the idea that it looks like the Submariner at thousands of dollars more. In fact, it makes no sense to me at all to waste thousands on a Roles Submariner, when the Invicta Pro Diver does as good a job, and lasts for years. The timing is deadly accurate, and frankly it’s all you could ask from a watch at this price or even more. Mine was $120. when it first came out. Here’s a tip, if you want your watch to look like it just came out of the box new. Take a small wad of tissue and clean it with common Rubbing Alcohol, then wipe it dry immediately. You’ll see it sparkle like new each time you clean it. As I mentioned, mine is more than 5 years old now, looks great, and still keeping perfect time. 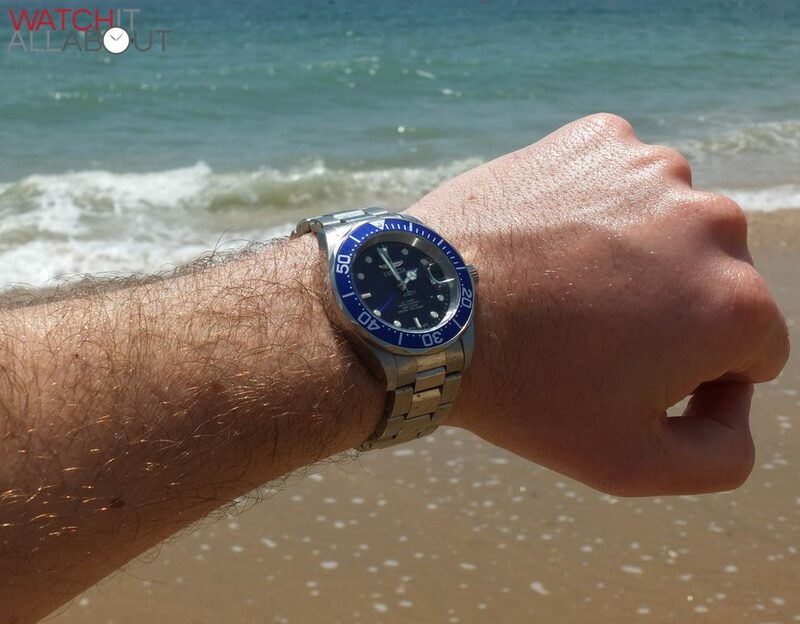 Great review of a great watch. I have had two Invicta 8926 Pro Divers (the first one was stolen) and loved them both. I think my 8926OB (black dial with coin edge bezel) is more of a Sub homage. I recently bought the 9094 and I decided to mod it by having my watch guy remove the Mercedes hands, replace them with skeleton hands, and remove the cyclops. 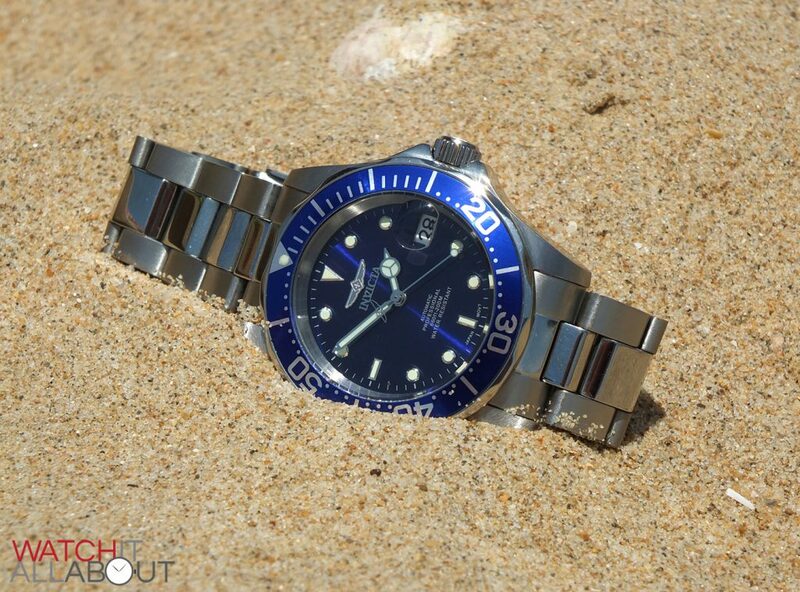 Thus, with the blue dial and the crenellated bezel, it should look more like an Omega Seamaster Pro. I pick it up next week. If you’re interested I’ll send a couple of pics showing how it turned out. My husband collects watches of every price range and is happy to add this one to his collection. The weight is perfect, adjusting the band is easy, as is setting the time and date. 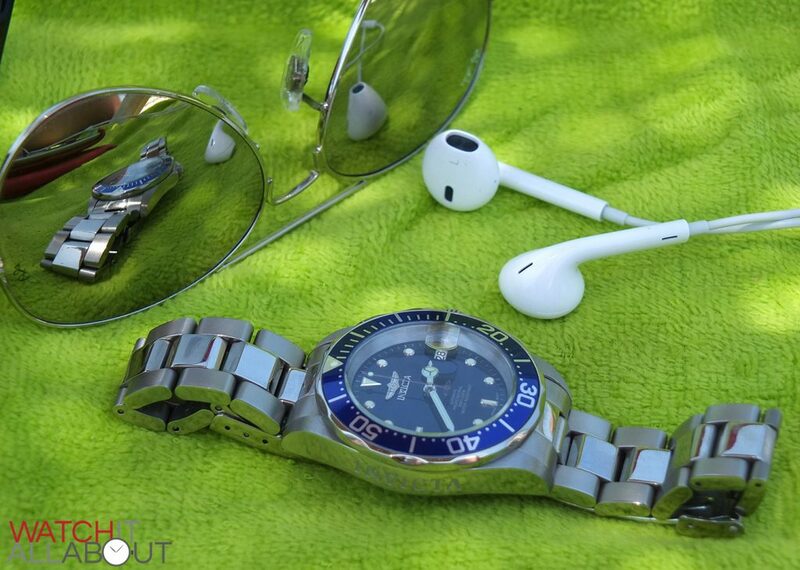 The Watch is a great peace of work and does really stand out infront of other watches at the same price in the 100 usd and less range. Thank you for a good and detailed review. I’ve had two of these, black and blue. Couldn’t turn the bezel on very hot days, and it was difficult on very cold days. Also the crown would come out one notch when I was active. Had they better knurling on the bezel I would have kept them. Also the blue was pretty flashy. Found myself not wearing it with certain color shirts. 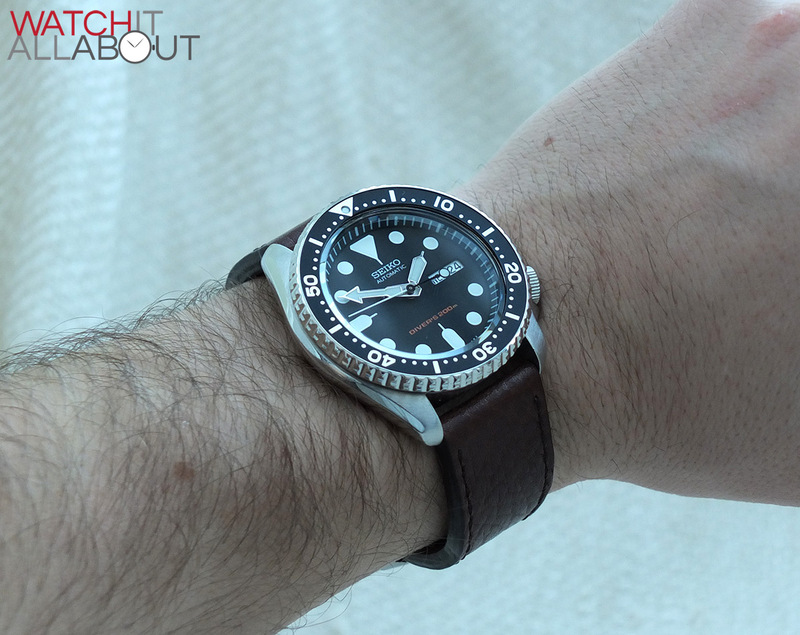 Anyway, the bezel needs a more aggressive purchase, like the Seiko SKX007 or 013 watches. Deal breaker for me, got half as much as I paid even though I had the boxes, paperwork, and extra links, and almost no visible wear. So far it is losing 0.6 seconds per day over the first month, and is beating my Breatling and Omega like a drum. 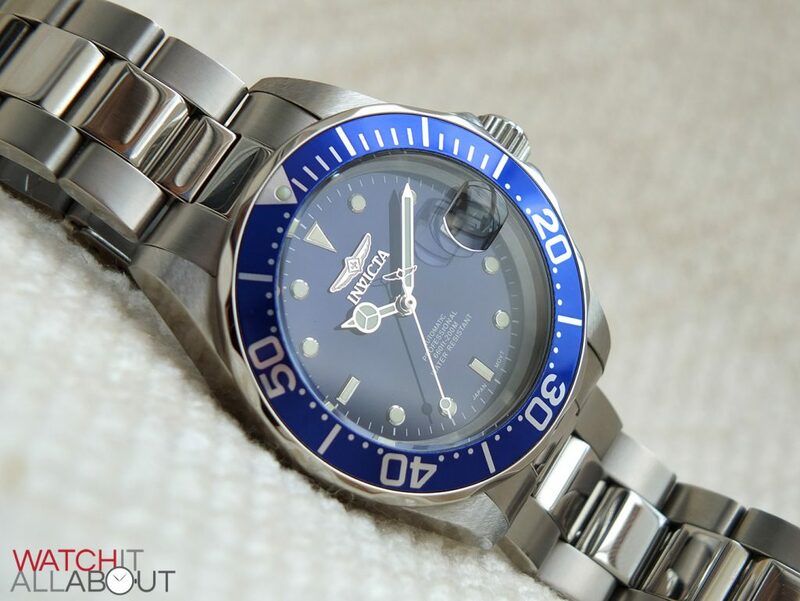 This is actually the best automatic watch I have ever owned at 1% the cost of my Breitling! How about that watch snobs? I regulated it when I got it and the NH35A is staggeringly accurate. When worn it is staying to less than 30 seconds out a month!. It is by far the most accurate of my automatics or hand winds. I think the quality is pretty good, no matter the price. I use it when cycling and motorcycling and it stands up to being caught in the (very rare) Scottish rain. I shower and swim with it and so far, no issues. Only downsides I think are that with the scalloped edge the bezel can be tricky to turn, but I never use that function anyway. The lume could be stronger too. I tend to avoid paying for expensive “tool” watches as I can be a bit clumsy with the watch (failing to take them off!) when working on bikes or my car, so it fits the bill very well. It gives me as much pleasure (particularly because I adjusted it myself) as either of the vintage Longines dress watches I have. Great web-site. Looking forward to reading all the reviews. I think I know what my next purchase will be… who knew there was a watch brand from Leyden! Great review! I love my Pro Diver but can anyone tell me why mine has a much less custom rotor than the one you reviwed. (Inscribed Miyota Co, plain half moon with one directional arrow) Also the case back is not deeply engraved as in the watch reviewed but laser etched. 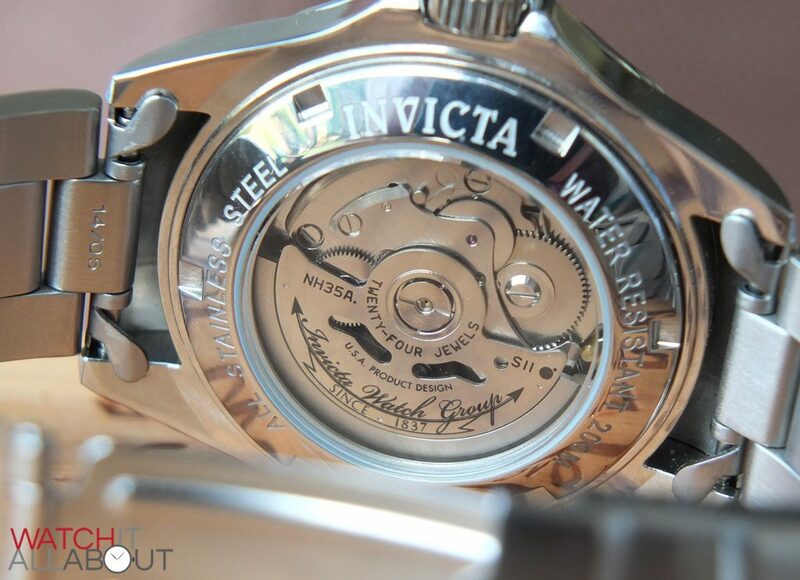 The Invicta is deeply engraved on the side tho. 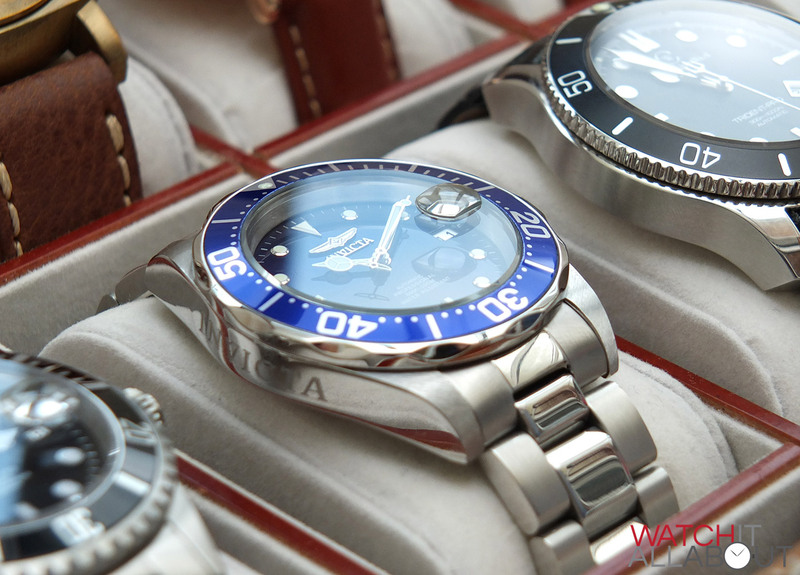 A few years back the Invicta Pro Divers came with a Miyota movement (another Japanese movement, associated with Citizen). It is also a decent quality movement, but not quite as highly regarded as the Seiko NH35A installed in more recent years. I do not believe the Miyota movement used by Invicta supports hacking or hand-winding (but I’m not certain). Thanks David for the info! 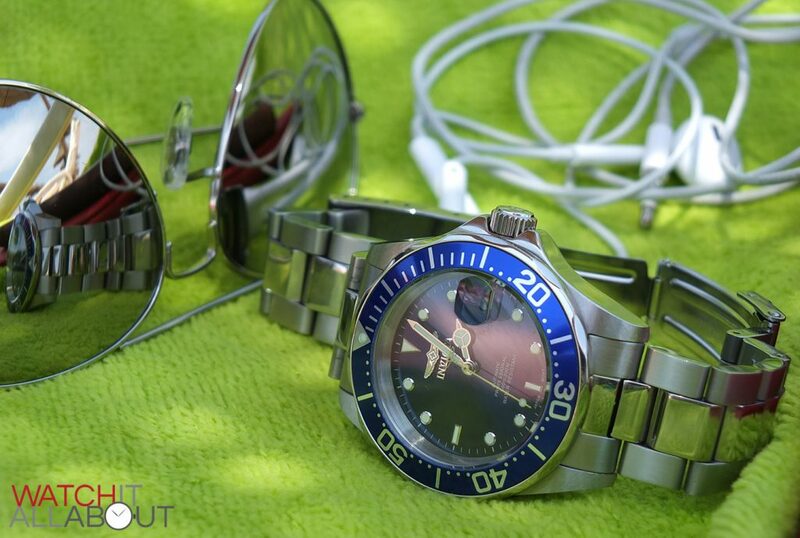 I am able to hand wind the Miyota movement on my Pro Diver. Thanks again!! You mention your disappointment in the rather rough brushed finish on the lugs of the 9094, but that finish is in fact virtually identical to that found on the Rolex Submariner lugs. 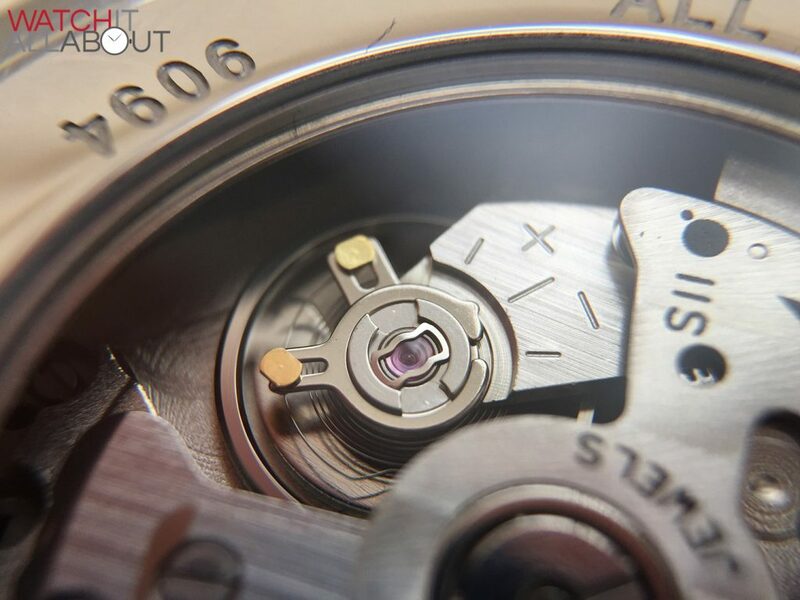 Find a close-up pic of the lugs on the Rolex 14060M and observe the brushed finish…it looks quite rough on a close-up view. 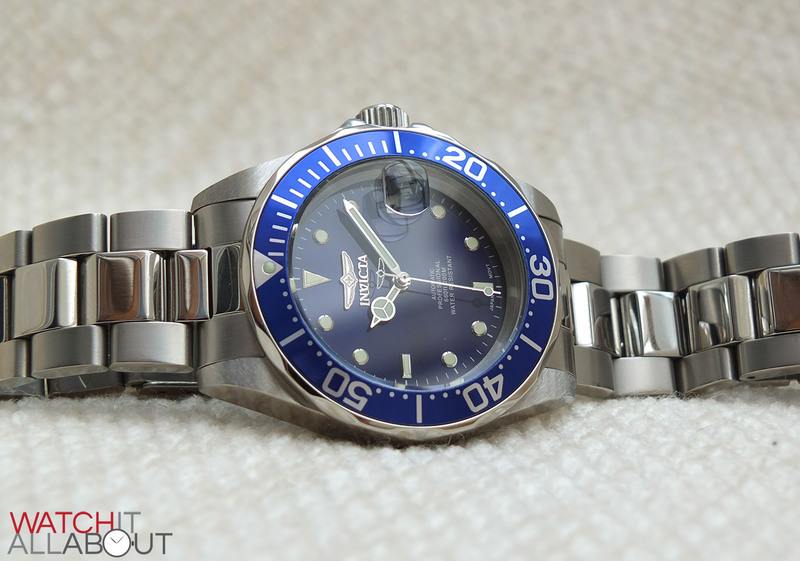 IMO the Invicta lugs are a virtually identical match to those on the Rolex. I’ve worn a Miyota-engined 8926C (the original 8926OB) for 10 years and the coarse brushed finish on the lug faces was one of the many similarities I immediately noticed between that watch and the Rolex Sub.